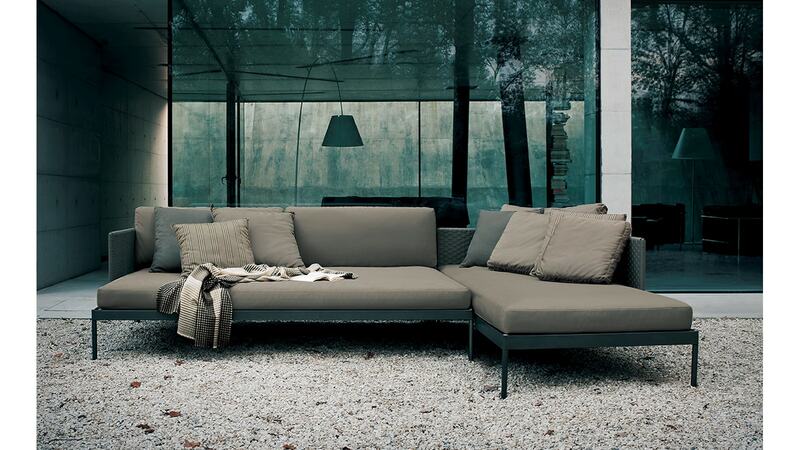 BASKET, one of the iconic collections of RODA, is a project characterized by the extreme formal simplicity and composed of elegant modular sofas and tables which have been created to cross the traditional boundary between indoor and outdoor brilliantly and make every living area elegant and sophisticated. The sturdy stainless steel structure combined with the strict line of the backrests and seats are offset by the absolute comfort of the cushions. Besides the classic versions with stainless steel structure in smoke colour with grey belts and milk with sand belts, Roda presents the new and exclusive stainless steel with transparent matt varnish surface finish: the stainless steel is brushed and then varnished with a matt transparent painting which reveals the preciosity and real aspect of the structure, protecting it from the weather conditions. The new finish is matched with a double colour weaving and elegant mix of sand and grey belts, like a mosaic. Click here for 350 module product specifications. Click here for 353 module product specifications. Click here for 354 module product specifications. Click here for 357 module product specifications. Click here for 358 module product specifications.